There is a rugby league revolution going on in North America right now – and it has nothing to do with Jarryd Hayne. Starting next week the Canada Wolverines take on the USA Hawks and the Jamaica Reggae Warriors in qualifying matches for the 2017 Rugby League World Cup. Each team will play against the other sides between December 4 and 12 in Florida in the USA. I am excited to see the games (which will be streamed live around the world for anyone with a smartphone to access) not because it is an emerging sport in some big countries, but because I have a personal connection to the Canada Rugby League. Rugby league in Canada has been played only since 2010, when some of the league-loving guys in Toronto decided to start a competition. Cory Tukeli and Eric Perez, among others, established the Canada Rugby League in that year and their progress has been astonishing. Toronto was the hub of rugby league in the early years and the competition now has four teams. International rugby league was a greater success, for with some savvy marketing and connection with key corporate partners the CRL has been able to attract crowds of 5000 to Lamport Stadium in Toronto for internationals against USA, Jamaica and England Lions. Yet they didn’t have a nationwide footprint, in a nation that stretches over 5000 kilometres from east to west and comprises a territory almost 10 million kilometres squared. Not to mention a population of over 35 million. As an Australian married to a Canadian who then moved to British Colombia (on Canada’s west coast) for work reasons, O’Keefe packed his love of rugby league with his check-in baggage. And on the west coast of Canada – a long way from Toronto – there wasn’t much of our game to be seen. Fortuitously for rugby league, the arm of the Australian business that O’Keefe was meant to set up was met with some regulatory hurdles, so he had some time on his hands. So what do you do in a foreign land when you’re waiting for red tape to be cleared? You set up a rugby league competition, of course! O’Keefe established the British Colombia Bulldogs as a regional representative team in 2012 and has since made impressive progress with the local teams to create a viable competition. I met O’Keefe in early 2013 when he came back to Australia (with a British Colombia Bulldogs jersey that I had bought from him). I invited O’Keefe out to an NRL referees training session on a Wednesday morning were he got an opportunity to see how we trained and the whole referee operation at Sydney Olympic Park. He was in Australia to set up a program with the Parramatta Eels whereby two of his promising players could train with the full-time squad for a month of the 2014 pre-season and take those skills back to Canada. It proved such a success that the following year four players were invited to travel to Australia and experience the same specialist coaching. Phil Cummings as general manager of the Parramatta Junior League was instrumental in making the arrangements and now that he is working at Penrith Panthers the partnership has been transferred farther west. Its continuation across NRL club rivalries illustrates the importance he sees in the game’s relationship between Canada and Australia. 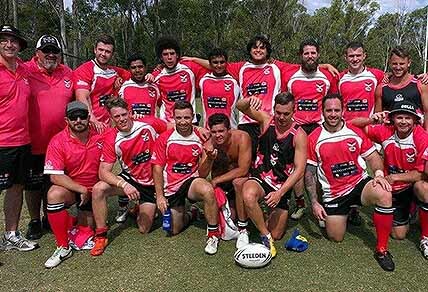 Scrub high speed to February 2015 and Canada’s Australian-based players, as well as the four natives on their rugby league education program with the Eels, participated in the Cabra 9s knockout tournament, which this year was held at St Mary’s in Western Sydney. Upon volunteering my expert services of holding a flag up straight, supplying a portable marquee, and cutting up watermelon into equal wedges, my application as part of the support staff for the tournament was accepted. That was when I received a personal view of what Canada rugby league was all about. The match results were not important. Coach Aaron Zimmerle, who is the current coach of the Queensland Cup team Tweed Heads Seagulls and Queensland Residents representative side, was player-coach for the tournament. He recognised the opportunity before him; with four Canada locals and the rest of the squad embracing their Canadian heritage, the genesis of a World Cup campaign was emerging. Canada’s key playmaker, Souths Logan Magpies half Rhys Jacks, was injured against Helensburgh Tigers in the first game. He came off before half-time with an injured hand. As soon as I looked at it I knew the news wouldn’t be good. “Mate almost certainly fractured a bone there. It’s swollen already – get it checked by the qualified guys on the other side of the park but go and get an x-ray as soon as you can. Of course I offered the usual disclaimers – the information is from a former touch judge with a University Degree in Ancient History, so my advice is general in nature, and you should consult a medical professional. Rhys went off to get an x-ray, the team got on with the competition and won that game 12-10 without their halfback. The next game was a defeat of a Philippines Youth team 16-14, which sent Canada to the top of their group. The finals against the top group teams was always going to be a challenge, but it was where I had the privilege to hear Zimmerle talk to his team in an environment where I had never previously been part. I couldn’t do justice to his words by trying to write them down for you. I can’t remember exactly what he said because I was caught up in the moment of a pre-game pep talk that I have never heard. Zimmerle described overhearing people who had said: “They’ve topped their group – Canada!” and “They can’t be Canadians – they were too good.” At which point he refocused his players on the task at hand. This was about their heritage, their personal pride today, and forging a path for Canada rugby league to follow. I can’t remember any of the specific words Zimmerle spoke. All I remember is that I was ready to run through a concrete wall. And I was only holding a water bottle! So that was the end of the section for Canada, but not the end of the story. There was a prearranged party for all the Canada crew that Saturday night, and it was going to be a roaring, fun party no matter how far the team progressed. Phone calls were already being made to the airline to change the flight back to Queensland from Sunday morning to Saturday night. Rhys had made the decision himself to go home early and get an extra day recovery rather than have a drink with the boys that Saturday night. A rugby league player forgoing a party to help his body repair? What is this, some weird Gen Y dude? No, it’s Rhys Jacks, a professional in all respects. And alongside his brother Ryley he will be doing his best to get Canada to the 2017 Rugby League World Cup. One per cent of his determination in each player will help Canada qualify.